Armageddon, World War III, Antichrist, and the second coming of Jesus (p) --- Islam Muhammad predict WW3 the future Islamic articles. The Bible describes in a vivid language the corruption, destruction, and death typifying the end of times. We see the godly forces confronting the evil of Satan, the Antichrist, and Gog and Magog. We learn that the cataclysmic events will take place in the Middle East. But still the picture needs to be completed. Unanswered questions need to be answered. Who are Gog and Magog? Where will Jesus return? Where in the Middle East will Jesus confront the evil military forces? What nation(s) will supply the forces? Where will the 'Antichrist be slain? The Holy Prophet Muhammad(p) has prophesied about several events that will occur just before the advent of the day of judgment. Among these, Muhammad(p) has foretold the return of Jesus(p), which will materialize when a one eyed claimant to divinity (Antichrist) will attempt to misguide the humanity into worshipping him. Messiah will descend from the heavens in Damascus, pray behind Imam Mahdi, pursue and kill the Antichrist, destroy the savage and unbelieving armies of Gog and Magog, and bring peace and brotherhood to the world. Christians will recognize the truth and accept him only as a Messenger of God; the religion of God (Islam) will justly rule the world. "I swear by Him in Whose hand is my soul: the son of Mary shall descend among you as a just ruler. Then he will break the Cross, and kill the swine and put an end to war (in another Tradition, there is the word Jizyah (tax) instead of war, meaning that he will abolish of jizyah); A then there will be such abundance of wealth that nobody will like to accept it, and (conditions will be such that) performing of one sajdah (prostration) before Allah will be considered better than the world and what it contains." (Bukhari and Muslim). "Jesus son of Mary shall descend; then he will kill the swine and destroy the Cross; and a congregation will be held for him for the Prayer; and he will distribute so much wealth that people will be satiated with it; and he will abolish the tribute; and he will encamp at Rauha', B and from there will go to perform Hajj or 'Umrah, or both." (Muslim). 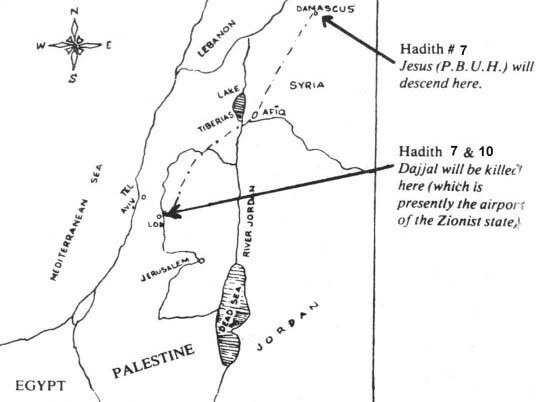 The Holy Prophet (after making mention of the appearance of the Dajjal) said: "In the meantime, When the Muslims will be making preparations to fight him, will be lining up (for the Prayer) and the lqamah will have been pronounced, Jesus son of Mary shall descend and lead them in the Prayer; and the enemy of Allah (Dajjal i.e. the Antichrist) on seeing him shall start dissolving like salt in water. If Jesus were to leave him alone, he would melt to death anyway, but Allah will have him killed at his hand, and he will show his blood on his spear to the Muslims." (Muslim). "There is no prophet between me and him (i.e. Jesus Christ), and he shall descend. So, recognize him when you see him. He is a man of medium height, of ruddy and fair complexion; he will be dressed in two yellow garments; the hair of his head will appear as though water was going to trickle down from it, whereas it will not be wet. He will fight people in the cause of Islam, will break the Cross and kill the swine and will abolish jizyah; and Allah will put an end to all communities in his time except Islam; and he will slay the Antichrist (Dajjal); and he will stay in the world for 40 years; then will die and the Muslims will offer the funeral Prayer for him." (Abu Da'ud and Ahmad). "... then Jesus son of Mary will descend. The leader of the Muslims will say to him, 'Come, lead us in the Prayer', but he will say, 'No: you yourselves are leaders over one another." C This he will say in view of the honour that Allah has bestowed on this Community." (Muslim and Ahmad). The Holy Prophet (while relating the story of the Dajjal) said: "At that time suddenly Jesus son of Mary (on whom be peace) shall appear among the Muslims. Then the people will stand up for the Prayer, and he will be asked, 'Step forward, 0h Spirit of Allah (and lead us in the Prayer); but he will say, 'No: your own leader should step forward and lead the Prayer.' Then, after offering the Morning Prayer, the Muslims shall go forth to fight the Dajjal.' He said, 'When the liar will see Jesus, he will start dissolving like the salt in water. Then Jesus will advance towards him and will slay him; and it will so happen that the trees and the stones will cry out: '0h Spirit of Allah, here is a Jew hiding behind me.' None will be left from among the followers of the Dajjal, whom he (i.e. Jesus) will not kill." (Ahmad). "In the mean time when the Dajjal will be busy doing this and this, Allah will send down Messiah son of Mary, and he will descend in the eastern part of Damascus, near the white minaret (tower), dressed in the two yellow garments, with his hands resting on the arms of two angels. When he will bend down his head, water drops will appear trickling down, and when he will raise it, it will appear as though pearl--like drops are rolling down. Any disbeliever whom the air of his breath reaches--and it will reach up to the last limit of his sight will fall dead. Then the son of Mary will go in pursuit of the Dajjal, and will overtake him at the gate of Lod, D and will kill him." (Muslim, Abu Da'ud: Kitab, Tirmidhi, Ibn Majah). "The Daijal will appear in my Ummah (nation), and will live for forty (I do not know whether he said 40 days, or 40 months or 40 years). Then Allah will send Jesus son of Mary. He will closely resemble 'Urwah Bin Mas'ud (a Companion). He will pursue him and kill him. Then for seven years the people will live in such a state that no ill-will and enmity will exist between any two of them." (Muslim). Then in the morning Jesus son of Mary will join the Muslims, and Allah will cause the Dajjal and his hosts to be routed, until the walls and the roots of the trees will call 'out: "0h believer, here is a disbeliever hidden behind me: come and kill him." (Ahmad, Hakem). Then Jesus (on whom be peace) will descend, and Allah will cause the Dajjal to be killed near the mountain pass of Afiq. E (Ahmad). Exactly at the time when the Imam of the Muslims will have stepped forward to lead them in the Morning Prayer, Jesus son of Mary shall descend upon them. The Imam will step back so that Jesus may step forward (to lead the Prayer), but Jesus, placing his hand between his two shoulders, will say, "No, you should lead, for the congregation has assembled to follow you. So, the Imam will lead the Prayer. After the salutation, Jesus will say, "Open the gate;" so the gate will be opened. Outside there will be the Dajjal along with 70,000 of the armed Jews. As soon as he will look at Jesus (upon whom be peace) he will start melting like the salt in water, and will flee. Jesus will say, "I shall strike you a blow which will not let you live." And he will overtake him at the eastern gate of Lod, and Allah will cause the Jews to be defeated.... And the earth will be so filled with the Muslims as a vessel is filled with water. The entire world shall recite and follow one and the same Kalimah (word) and none shall be worshipped except Allah." (Ibn Majah). The Dajjal would be followed by seventy thousand Jews of Isfahan (in Iran) wearing Persian shawls. Narrated Umm Sharik: I heard Allah's Messenger (peace_be_upon_him) said: The people would run away from the Dajjal seeking shelter in the mountains. She said: Where would be the Arabs then on the day? He said: They would be small in number. The Last Hour would not come until the Romans would land at al-A'maq or in Dabiq. An army consisting of the best (soldiers) of the people of the earth (An international army?) at that time will come from Medina (to oppose them). When they will arrange themselves in ranks, the Romans (i.e. All the white Europeans including the Americans) would say: Do not stand between us and those (Muslims) who took prisoners from amongst us. Let us fight with them; and the Muslims would say: Nay, by Allah, we would never get aside from you and from our brethren that you may fight them. They will then fight and a third (part) of the army would run away, whom Allah will never forgive. A third (part of the army), which would be constituted of excellent martyrs in Allah's eye, would be killed and the third who would never be put to trial would win and they would be conquerors of Constantinople (the capital of the Romans --- can be any city). As they would be busy in distributing the spoils of war (amongst themselves) after hanging their swords by the olive trees, the Satan would cry: The Dajjal has taken your place among your family. They would then come out, but it would be of no avail. And when they would come to Al-Sham (Damascus or Syria), he would come out while they would be still preparing themselves for battle drawing up the ranks. As Dr. Mary Weaver, Professor of Religious Studies at Indiana University writes, "Abraham did have a son (two in fact), though the first, Ishmael, drops out of the story." Although Ishmael and his descendents were also included, but-this was qualified for both sons of Israel and sons of Ishmael with obedience! Since the Jews fail to accept Jesus (peace be upon him) as the true Messiah, which both Christians and Muslims know to be the truth, the Antichrist will arise as their "Messiah". The shrewd false Messiah will take advantage of the insidious Zionist military expansionist fervor ultimately leading to the downfall of the Zionists. Already Muslims have been mercilessly expelled from Palestine while Zionists in their bloodthirsty lust for land and power are not' satisfied with Palestine. In their arrogance they openly admit that they want all of Syria, all of Lebanon, all of Jordan in addition to Iraq, Iskenderun from Turkey, the Sinai, and the Delta area from Egypt and the upper Hejaz and Najd from Saudi Arabia. Yes, they even want the holy city of Medinah. According to the Hadith No.11 it is very clear that the Antichrist will enter Syria followed by 70,000 armed Zionists to position himself in Damascus. One morning, Jesus (pbuh) will descend in the eastern part of Damascus near a white minaret to begin the holy campaign against the false messiah. The Antichrist will flee towards Israel through the Afiq Pass, but Jesus (pbuh) will overtake him and destroy him at the airfield in Lod just 13 miles south east of Tel-Aviv. The Israelites will be destroyed putting an end to their treacherous community; whereas with the destruction of the Cross, all the religious communities will merge into the single community of Islam. Notice that according to a hadith, one of the signs before the Resurrection will be Gog and Magog. Remember also that the Bible associates Gog with Meshech (Moscow) and Tubal (Tubalsek), which will come from the north invading Israel amid earthquakes, fire, and brimstone. According to Maududi, Gog and Magog will be let loose in the sense that they will swoop down on the regions of the earth like a beast of prey which is set free from its cage suddenly. (See Qur'an Al-Anbiyaa 94-l03.) The Qur'an also mentions Gog and Magog in relation to the Day of Resurrection. They said: "0 Zul-qarnaini. The Gog and Magog (people) do great mischief on earth: Shall we then render thee tribute in order that thou mightest erect a barrier between us and them? He said: "(The power) in which my Lord has established me is better (than tribute): Help me therefore with strength (And labour): I will. erect a strong barrier between you and them: "Bring me blocks of iron." At length, when he had filled up the space between the two steep mountain-sides, he said, "Blow (with your bellows" Then, when he had made it (red) as fire, he said: "Bring me, that I may pour over it, molten lead." Thus were they made powerless to scale it or to dig through it. He said: "This is a mercy from my Lord: But when the promise of my Lord comes to pass He will make it into dust; and the promise of my Lord is true." On that day We shall leave them (Gog and Magog-Yajooj and Majooj) to surge like waves on one another: The trumpet will be blown and We shall collect them all together. And We shall present Hell that day for Unbelievers to see, all spread out,-(Unbelievers) whose eyes had been under a veil from remembrance of Me, and who had been unable even to hear?. Note: Gog and Magog are generally believed to be the wild tribes of Central and Northeastern Asia including the Tartars, Mongols, Huns, and Scythians. This is False! This belief contradicts with many Hadeeths. Gog and Magog (Ya'juj & Ma'juj) are hidden peolple from us. A In other words it means: "All kinds of differences among the communities will disappear and human beings will join one community, the Community of Islam; thus, war will be put to an end to, and jizyah will cease to be imposed." B A place at a distance of 35 miles from Madinah. C 'That is, "Your leader should be from among yourselves." D Lod (Lydda) is situated 13 miles south-east of Tel-Aviv, Capital of Israel, and is the most important airport of the country. E Afiq (mod. Fiq) is the last Syrian city on the border between Syria and Israel. A little further on towards west at a few miles is the Lake Tiberias (Sea of Galilea), the source of River Jordan. Towards the south-west in the mountains is a low pass, which descends about 2,000 feet to the point from where River Jordan comes out from Lake Tiberias. This same mountain path is called 'Aqabah Afiq the pass of Afiq'.